Info "Follow the instructions for raising and lowering the flag!" Hare Raising is one of Orbulon's Microgames in WarioWare: Smooth Moves. Its name is a pun on "hair-raising". The objective is to follow the hare's commands by raising the appropriate flag when prompted. The Nunchuk controls the white flag and the Wii Remote controls the red flag. 1st level difficulty: One command. 2nd level difficulty: Two commands. 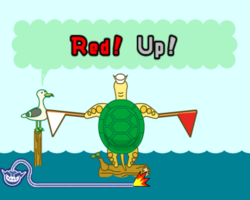 Tortoise & Hare, a minigame unlocked after beating Orbulon's stage, is based on this microgame. This page was last edited on December 8, 2018, at 15:27.